MADRID –- The past year has seen a bold new round of provocations in the South China Sea, where the People’s Republic of China is trying to expand its regional hegemony. The central issue is territorial. According to the United Nations Convention on the Law of the Sea, nations can claim exclusive economic rights in waters up to 200 nautical miles off their coastline. Where these zones would overlap, claims generally go to the nearest state. 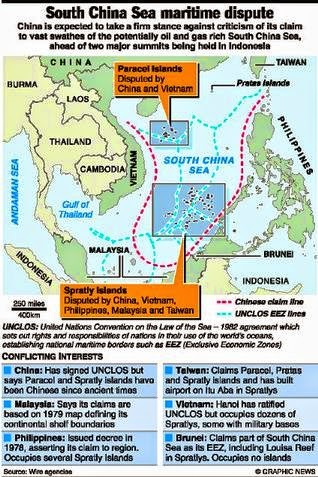 According to these principles, most of the economically vital South China Sea is shared between Vietnam, China, Taiwan, Malaysia, Brunei, and the Philippines. 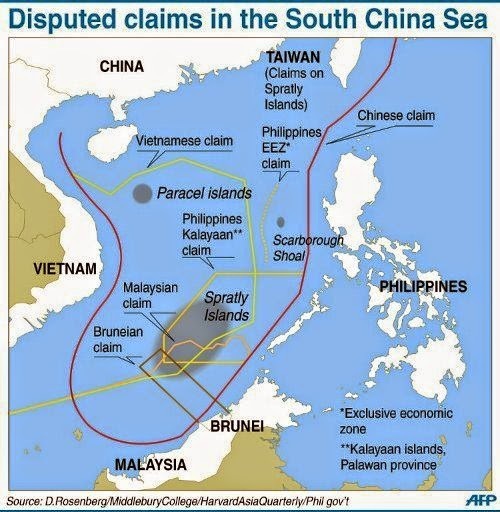 But China claims the Spratly islands, a rocky and unpopulated archipelago deep inside the Philippines’ exclusive economic zone (EEZ)—and the Paracel islands, a group of reefs and islands close to Vietnam. According to Beijing, its EEZ projects from both island chains, which puts almost the entire South China Sea in Chinese hands. At stake is strategic control of sea lanes that carry an estimated $5.3 trillion in annual trade, highly lucrative fishing stocks, and promising oil and gas resources. Although most of the South China Sea’s proven reserves lie in undisputed areas, the U.S. Geological Survey estimates that about 2.5 billion barrels of oil and 25.5 trillion cubic feet of natural gas may be available around the Spratlys. That is, by gaining effective control over disputed areas, China can strengthen its legal position in the sense of the old saying “possession is nine tenths of the law.” If it can actively exploit the disputed zones and convince world markets to accept its claims, other nations’ legal objections will be largely moot. China is working to establish such control by a combination of unilateral resource grabs and confrontational moves against rival militaries in the region. On January 1 of last year, China instituted new rules requiring foreign fishing vessels to obtain permits in order to fish in much of the South China Sea. The move drew criticism from Vietnam, the Philippines, and the United States, but none were in a position to force the Chinese to back down. In an excellent analysis the following month, analyst Robert Haddick called out Beijing for pursuing a policy of “salami-slicing”. The metaphor contextualizes the new fishing restrictions as part of a larger pattern of incremental moves that included the sudden establishment of a Chinese city on Woody Island in the Paracels in July 2012, and the declaration of an Air Defense Identification Zone over the East China Sea in November 2013. In 2014, Chinese survey vessels have reportedly been operating discreetly in the Philippines’ EEZ, likely to gain a better sense of the petroleum resources that might be available there. Beijing was clearly betting that no single step would be enough for its neighbors to risk armed conflict—but that collectively, they would achieve China’s goal of controlling the South China Sea. In the months that followed, the salami-slicing continued. In March 2014, Chinese Coast Guard vessels turned back a pair of ships sent by Manila to reprovision Filipino troops stationed on a disputed outpost in the Spratlys. Then in May, China set up a billion-dollar oil rig unannounced in disputed waters off Vietnam, surrounded by a flotilla of protective ships from the Chinese Maritime Police Bureau. Vietnamese vessels went out to meet them, leading to several days of vigorous clashes between the two sides, using water cannons and ramming actions. In June, Hanoi released video of a Chinese vessel ramming a Vietnamese fishing boat that soon sank. China appears not to have suffered any comparable losses. 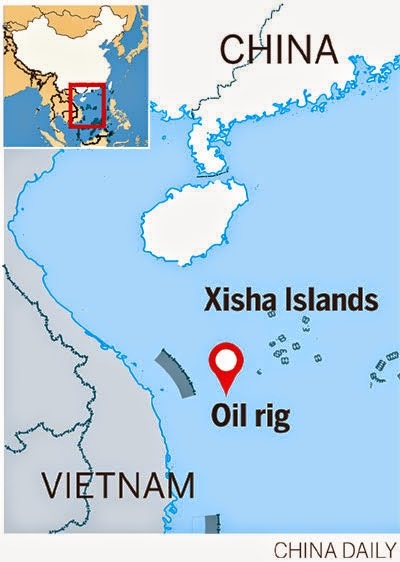 In July, China unilaterally withdrew the rig— stating that it had completed its exploratory mission — but Vietnam would have been in no position to prevent it from staying. Then, in August, a Chinese fighter intercepted an American reconnaissance plane over the South China Sea, performing abrupt manoeuvres perilously close to the U.S. aircraft. This risked a repeat of the 2001 incident off Hainan Island where such a mid-air collision led to a diplomatic crisis after the crew of the crippled American plane was interned on Chinese soil for 11 days. Instead of sober reflection, Chinese Rear Admiral Zhang Zhaozhong exhorted his pilots: “A knife at the throat is the only deterrence. From now on, we must fly even closer to U.S. surveillance aircraft”. This combination of brinksmanship and salami-slicing by incremental and escalating actions is dangerous indeed. The worst-case scenario, of course, is a full-on armed confrontation—but both the Chinese and their opponents realize that war would be catastrophic. Much more likely is a steady drumbeat of small grabs that pose risk to those wishing to do business in the South China Sea. 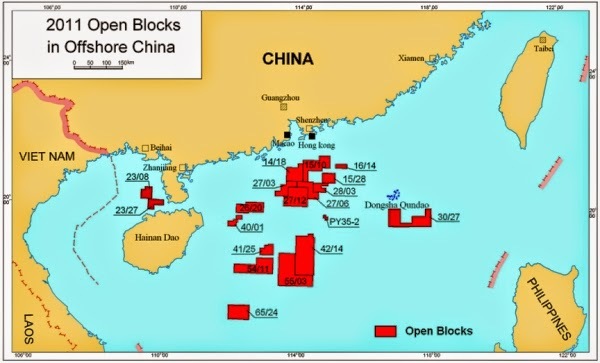 In 2012, China National Offshore Oil Corp invited foreign companies to bid on nine oil exploration blocks within Vietnam’s internationally-recognized EEZ, apparently including some areas which had already been leased out by Vietnam. While major firms like Exxon Mobil have so far avoided wading into the disputed zones, and will likely continue to do so, smaller players with less to lose have expressed interest. In comparison, around the same time, the Philippines invited bidding on two oil blocks in disputed territory, but received rather little interest. Going forward, how oil and gas companies invest their money will send a strong signal about who is winning the struggle for the South China Sea. Those who lease disputed blocks from Vietnam or the Philippines are betting that China will ultimately bow to pressure by the United States and its allies in the region. Those who lease from China are betting that Beijing’s grabs will prove irreversible. Whatever firms bet, there will be more provocations. Survey ships and drilling platforms can expect to be harassed by the other side, and company personnel and equipment may be endangered by the struggle going on around them. Some firms will likely hire private security vessels for protection. Although such forces would be no match for Chinese warships in an armed confrontation, their presence would make it riskier and more difficult to drive away client assets. Armed guards aboard platforms could be employed as an additional deterrent. This poses serious risks, though—untrained private security could instigate a clash by mistake, and even a small spark in the South China Sea has the potential to escalate to international conflict. Further, the 100 Series Rules for the Use of Force, which were developed in 2013 to provide broad guidance for private maritime security companies, are intended for actions against pirates, and would not provide sound guidance for potential standoffs with state actors. For companies wishing to hire security, then, retaining only the most experienced and professional private maritime security companies must be a priority. About John-Clark Levin is an author and maritime security expert, currently pursuing his research at Harvard University. He has written for publications such as the Wall Street Journal, Southern Economic Journal, Pacific Maritime Magazine, and War on the Rocks. He has lectured on the subject of private maritime security at institutions such as Johns Hopkins University, Georgetown University, the Center for Security Policy, and the U.S. Naval War College. About Graham Penrose is the owner of TMG Corporate Services, Intelography & JGE Kinetics: Established in 1994 TMG Corporate Services serves clients in Europe, the USA, Asia-Pac and Africa providing Private Maritime Security Services; Private Military Security Services; Global Asset Tracing & Recovery; Security & Risk Management; Specialist Surveillance Services; Counter & Anti Surveillance Services; Human Intelligence (HUMINT); Open Source Intelligence (OSINT); Close Protection Services; Digital Forensics, Image Enhancement & eDiscovery and HEAT (Hostile Environment Awareness Training). JGE Kinetics sources and supplies - under license / EUC - armaments, armoured vehicles, surveillance equipment, UAV drones and military communications equipment. About Intelography: Intelography offers subscription based access to risk profiling, threat assessments and security trends for Europe, the Middle East and Africa. Providing content and insights that allow organizations to inform the process of reacquiring, recommissioning, maintaining and protecting (physical and human) assets in conflict, post conflict or high risk areas. Content and analysis includes contributions from staff analysts, internationally recognized subject matter experts, guest contributors, content syndication from established industry observers and service providers, thought leaders, complimented by an extensive network of in country contributors (Israel, Libya, Egypt, Syria, Iraq, Afghanistan, Pakistan, India, CIS, Ukraine, Russia, the Balkans, West Africa). Subscription pricing varies according to access requirements and is offered on an ad-hoc, region specific or global access basis. Additional services include one-to-one analyst Q&A's, workshops, consulting, and re-publication rights. The YPG and YPJ are engaged in a fierce fight today with ISIS who have opened up a fourth front in the battle by launching attacks from the previously "safe" Turkish side of the town. It is unclear how ISIS can have been facilitated in this new strategy by a "member" of NATO, seemingly allowing ISIS launch an attack on the beleaguered town from within Turkish territory. The town and its brave defenders have unbelievably been under international political and economic embargo for three years. Boko Haram was founded in 2002 by Mohammed Yusuf, a Muslim cleric and Wahhabi theologian who created a school promoting radical Islamic principles (United States Institute of Peace, 2012). The derivation of Boko Haram translated means “Western education is a sin” (Owolade, 2014). Under Yusuf’s leadership, Boko Haram furthered its radical agenda with a bloody campaign of violence against rural communities. (Ndege & Essa, 2013). After Yusuf died in police custody in 2009, Abubakar Shekau rose to power and continued to spread the sect’s extremist philosophies. (Dorrell, 2014). Violence increased after the 2010 election of President Goodluck Jonathan, a Southern Christian (Owolade, 2014). In late May 2014 the Thai military seized power in a widely anticipated coup by the hawks who have been hinting at same for some time now. This is the twelfth coup in Thailand since the end of the absolute monarchy in 1932 (BBC, 2014) and the army justified their intervention on this occasion for the need to stabilize the volatile political situation. In February 2011, English photographer Charlie Waite had just finished a month long assignment across Libya capturing some of the country’s most iconic sites in a peaceful tranquil atmosphere. Less than two days after his departure, civil war had erupted (Kingsley, 2014). Libya has been in state of violent flux since then, long-term leader Muammar Gaddafi in power since 1969 was killed in October 2011, the National Transitional Council promptly declared Libya to be officially ‘’liberated’’ and on the road to ‘’democracy’’ (BBC, 2014). Using academics to locate missing or looted monies from current or post conflict zones makes sense – for part of the problem – namely forensic accounting, unravelling complex financial structures and corporate cloaking mechanisms like trusts and offshore havens. However giving the same academics the responsibility for actioning the recovery strategy informed by this analysis is flawed. They do not possess the dealmaking, “street smarts”, mediation, negotiation, fixer, logistical, operational or in-country savvy to succeed on the ground. Not long after a so-called ceasefire ended in eastern Ukraine Monday night, the Ukrainian military sent a column of artillery into Sloviansk and officially began its offensive. The Russian and Ukrainian governments, along with representatives from the OSCE, called for a new effort to establish another ceasefire, setting a deadline of Saturday for the resumption of talks. For now, however, the war continues. VICE News correspondent Simon Ostrovsky traveled around the outskirts of the city and visited several checkpoints where soldiers were preparing for what's to come. This report contains graphic images. The challenges in setting up a Private Military Company or when a firm is being employed as Privately Contracted Armed Security Personnel are more associated with the international compliance requirements rather than national ones, as the expectations are set and monitored by international bodies rather than by sovereign states - in order to avoid problematic local interpretations with respect to human rights and IHL (International Humanitarian Law) compliance. The International Code of Conduct for Private Security Service Providers (ICoC) is a Swiss government convened, multi-stakeholder initiative that aims to both clarify international standards for the private security industry operating in complex environments, as well as to improve oversight and accountability of these companies. Based on international humanitarian and human rights law, the Code was developed through a transparent and inclusive multi-stakeholder process. Full details on the process are available in the ICoC Timeline. The Code sets-out human rights based principles for the responsible provision of private security services. These include rules for the use of force, prohibitions on torture, human trafficking and other human rights abuses, and specific commitments regarding the management and governance of companies, including how they vet personnel and subcontractors, manage weapons and handle grievances internally. Do they need to have any particular registrations? Are they tracked globally? What concerns face a private military company founder? These are very expansive questions. 1. How are modern private military companies founded?